Much of the information we gather from the physical world comes to us by a scattering process. Scattering occurs when a beam consisting of light or charged particles strikes a target. The incident particle and target can simply recoil from the interaction, or other additional particles can materialize out of the energy of the collision. Information about the target and beam is carried away in the recoiling particles. Consider an everyday example: A beam of sunlight strikes a flower and scatters off the magnificent petals in the form of light particles at particular frequencies, which make their way to our eyes. From there the information is transmitted to the brain, which compares the data with existing data in the brain, and we recognize that we are looking at a beautiful flower. We gather information about much smaller, subatomic objects in the same way. 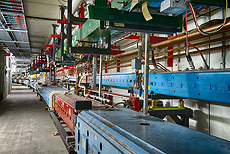 A beam from a particle accelerator strikes a target, and a detector records information about the recoiling debris: angles, momentum, energy of the scattered particles. The detector (an eye) registers the raw information and processes it before sending it on to a computer (a brain), which seeks recognizable patterns in the data that reveal basic aspects of the beam and the target. Through the ensuing analysis, we can distinguish between particles and measure their properties, such as charge, mass and spin, among others. Order discerned in this manner is a fundamental basis for our knowledge of the physical world. A subtlety of the process is that the incident beam must have specific properties in order to reveal the type of information we want with the desired level of detail. To explore the details of very small particles, scientists need to create beams with high energies. Electric fields are used to accelerate charged particles. An electric field resides between the two poles of a battery. The unit of energy used for beams of charged particle is the electronvolt (eV). One eV is the energy gained by an electron when it is accelerated through a one-volt potential. One way to create such a potential is with a 1.5-volt flashlight battery. An electron passing between the poles would gain 1.5 eV. However, a battery is not the best way to accelerate charged particles. To achieve 1 trillion electronvolts (1 TeV) with flashlight batteries would require 667 billion batteries, and the battery string would be roughly 24 million miles long. The good news is that I found batteries on sale for $1.15 each if we act fast. However, a quick review of the numbers reveals that batteries simply won’t work due to both cost and environmental issues. We need a better solution for accelerating our beams. In future columns I will summarize more reasonable solutions for achieving high-energy beams. We will discover that modern accelerators use a combination of brute force and ingenuity. What could be more fun?